By combining traditional historical enquiry with TEI XML encoding and decoding in a corpus analysis phase, the project aims at addressing research questions mainly related to the French and British positions on the topics of armament design and production and of armament control within the Western European Union (WEU) from 1954 to 1982. The paper focuses on the annotation of speakers (different countries and institutional representatives) and their discourse in a selection of institutional documents (minutes, notes, studies, memoranda) (encoding phase) and the identification of linguistic patterns on armament issues in their discourse, as well as the interpretation of results (decoding phase). This paper was revised on 2017-08-31 to include a missing reference: “(Heiden 2010).” The previous version is archived at https://journals.openedition.org/jtei/1733. 2This article proposes a new perspective as a new link in the chain, decoding-encoding-decoding, by considering the aspects involved in the digitization, TEI XML encoding, and corpus analysis of a collection of documents from the Western European Union (WEU) paper archives specifically intended for web publication. Placing our approach at the crossroad of digital scholarly editing and digital philology (Pierazzo 2014; Andrews 2013), as well as digital hermeneutics (Capurro 2010), we will focus on the TEI encoding as an addition to the original text, a “material” layer that further supports both machine and human interpretation. This type of materiality is actually related to the intrinsic performative quality of the code (either as markup or as part of a computer program), designed to be interpreted by the machine and to determine processing sequences and output that can become an object for further analysis. In this sense, we may move closer to Ihde’s (2003) concept of “material hermeneutics” by understanding code, and digital technology in general, as an “instrument” we can use in “hermeneutic ways” to produce knowledge. 3In this context, by combining scholarly editing and hermeneutic perspectives, the paper discusses aspects related to building a digital edition of historical documents, the interpretation of documents (decoding) on which the XML-TEI annotation is based (encoding), as well as the elements and methods subsequently considered for corpus analysis in order to support interpretation of discursive phenomena (decoding). Section 2 describes the collection that forms the focus of the study, with reference to the original paper archives and the transformation into electronic form. Section 3 presents a selection of encoded samples and the rationale behind the encoding, from the perspective of its further usage in the decoding process. In section 4, we detail this process placing emphasis on the importing of the encoded data into the corpus analysis platform, the different types of analysis performed, and a discussion of results. Section 5 concludes the paper with a review of both the benefits and limitations of the applied methods and the materiality underlying the encoding–decoding mechanism. 4The corpus (WEU-Diplo) chosen for TEI encoding represents a selection from the Archives nationales de Luxembourg1 of institutional documents concerning armament production and standardization, and armament control within the WEU,2 from 1954 to 1982. TEI XML has been considered an appropriate format both for building a scholarly online edition and for enabling corpus analysis. The general workflow was conceived with the aim of (partial) re-usability, albeit with some project-specific adaptations and readjustment, in order to support a variety of projects and document types in European integration history (primary/secondary sources: text, image, audio, video, and their transcriptions). As a matter of principle, an alternation of manual and automatic sequential processing has been applied to the corpus in such a way that, independently of the manual interventions, no information should be lost if it is needed to regenerate a certain state of the corpus in subsequent automatic phases (e.g., via XSLT). 5The first criterion for the selection of the documents was their relevance to a specific research question: what were the French and British positions on the major defense and security matters within WEU and, as subsidiary questions, the identification of the main defense and security matters discussed within the Council of the WEU and the importance placed on the WEU by the two member states, France and the United Kingdom, in their diplomatic strategy between 1954 and 1982.3 The choice of this case study was influenced by the fact that these two states played a key role in the birth, development, and organization of the WEU, as evidenced in the primary and secondary sources consulted. The idea was that by analyzing these issues we can also shed light on the organization’s contributions to European defense under the leadership (or lack thereof) of France and the UK. 6Other criteria influencing document selection were to obtain a balance among control, standardization, and production, together with a balanced number of documents across the decades, as well as taking into account that some documents are a logical follow-up of others (e.g., documents mentioning recommendations). Another criterion for selection, of secondary importance, was the actual form of the documents, since the research was also intended to evaluate the accuracy of OCR (optical character recognition) processing for different types of layout (title or content page), paper quality, and legibility of typewritten or handwritten characters and of particular markings as stamps. 7The selected sample contained 127 documents, 60 in English and 67 in French. For the first phase of the project, 55 documents in French were retained (a total of 290 pages) because of their importance for subsequent corpus analysis4 and publication. The majority of the documents were notes from the Secretary-General or Secrétaire Général (46, of which 37 were encoded because of their relevance to the research question), followed by minutes of meetings of the WEU Council or the Standing Armaments Committee (SAC) or of the working party on production and standardization of armament of the Interim Commission (15, all of which have been encoded). The sample also included 2 memoranda (both encoded) and 2 studies (1 of which has been encoded). 8The linguistic aspect was also considered. Although, given the availability of time and resources, the French version was prioritized for encoding (the English processing being planned for a later stage), in general, the chosen documents existed in both French and English versions, and when not mentioned as original language, the French documents were exact translations of the English ones or had the same status, since the documents were produced in both languages. The provider of the translations was the WEU itself (its daily work being undertaken in both languages) and, therefore, a source of official translations. 9From the 55 French documents selected for encoding, 5 had no English equivalent (3 notes, 1 study, and 1 memorandum); the remainder (all the meeting minutes and remaining categories) were available in both languages. More precisely, there were 16 documents mentioning the original was in French (of which 1 had no English equivalent), 12 with the original indicated as being in English, 10 mentioning the original both in French and English, 11 with no indication of the original language but a comparison between the French and English documents showed a similar structure and content, 4 available only in French bearing no indication of the original language, and 2 with an ambiguous marker (1 indicating French and English as original in the French version while the corresponding English document mentioned English as the original language, the other bearing no mention of the original in the French version but indicating English as the original in the corresponding English document). 10As a general rule, documents from the Secretary-General all exist in both French and English. In the nearly 400 folders consulted, there were very few exceptions; only occasionally were documents published in just one language. The French version was printed on blue paper and the English on white paper. Internal documents or notes from the Agency for the Control of Armaments (ACA) were only published in French, on very thin (“tracing”) paper. The notes and minutes were formal documents distributed to all the delegations of the Member States. 11The research aim was to gather a set of representative documents that expressed the French and British positions within the WEU’s different bodies, on different topics—the exploration of the design, production, and control of armament being only one of them. For this purpose, we used the WEU’s collection database, held in the Archives nationales de Luxembourg, and consulted several sections and collections including: (1) Interim Period; (2) Brussels Treaty Organisation (BTO); (3) 1954–87 within the Secretariat-General/Council’s archives; (4) Armament Bodies—Agency for the Control of Armaments (ACA) and Standing Armaments Committee (SAC). Other collections such as those relating to the military bodies or WEU operations were considered too recent to be consulted or still held a classified status. The documents were selected primarily based on their themes, strictly following the thirty-year rule. Each collection, comprised of several folders, with a “fiche” indicating the name of the section and collection, title of the folder, security classification such as WEU or NATO (NATO classified documents were not available), the period of time covered in the folder, the reference, and either keywords or a small summary of the main questions, although sometimes this was quite general. Once the folders or boxes were located in the WEU collection, they were consulted in situ and a selection of several documents was made according to the general theme armament. Before the digitization, a closer reading and final selection was performed. 12The initial documents were typewritten materials from the WEU archives. The transformation into electronic text necessitated the use of document scanning, OCR, manual post-processing error correction, conversion of the resulting styled Microsoft Word files to TEI XML P5 via OxGarage,5 and further XSLT transformation and enrichment using the oXygen XML Editor and GATE (General Architecture for Text Engineering) for NER (Named Entity Recognition). To prepare the digital documents for publication on the Web, further processing was carried out, to facilitate visualization and navigation in the browser at the document and collection level. 7 Examples of file codes: CPA-043; ACA-200; 421.00; 200.400.11 vol 1/1. 8 Speakers frequently referred to statements by other people from the same or another delegation. 14In order to address the research question, the main aim of the TEI XML encoding was to identify the speakers (element 11) in the various documents and the views (element 12) that can be attributed to them, whether directly or indirectly.8 The representatives (ministers, parliamentarians, ambassadors, and experts) from France and the United Kingdom were systematically identified, and, depending on their relevance to the research, the contributions of the German representatives were also encoded. Some examples of British speakers’ names are Christopher Steel, Samuel Hood, and Selwyn Lloyd; French speakers’ names included Alexandre Parodi, Jean Chauvel, and Geoffroy Chodron de Courcel. 15A generic nomenclature was developed to maintain consistency among the various speakers and to deal with cases when the speaker was not named: repres_fr (French representative), repres_uk (United Kingdom representative), repres_frg (German representative), repres_frg_fr_it (contribution on behalf of the German, French, and Italian representatives), repres_deleg_fr (French delegation), repres_deleg_uk (United Kingdom delegation),9 repres_cons_weu (representative of the WEU Council), repres_assb_weu (representative of the WEU Assembly), repres_aca (representative of the Agency for the Control of Armaments), respres_sac (representative of the Standing Armaments Committee) (see example 1). 16A semi-automatic NER processing involved the identification of other elements (13) in the texts, intended to be considered as whole units in the analysis, such as dates and the names of places, people, office positions, organizations, and bodies (Western European Union, the North Atlantic Treaty Organisation, the Standing Armaments Committee, and the Agency for the Control of Armaments), the event to which the document refers, as well as any other events mentioned.10 Finally, a series of “products” associated with armament were also encoded, for example Mirage, short-haul transport aircraft, light tank, Pluton, etc. 17Although other types of elements were annotated in the corpus (metadata, e.g., title, author, availability date, origin place, and confidentiality status; and structure, e.g., headers, footers, sections, paragraphs, and line breaks), the paper will focus on the content-related encoding—that is, speakers and their discourse—along with the above-mentioned categories of named entities, considered from the perspective of the subsequent decoding phase (analysis and interpretation). The TEI P5 specifications11 were applied, with no need for adding new classes, elements, or attributes. Example 1. Generic list of participants. WEU-Diplo: CR/58/8. an identifier (unique for the corpus) provided only when it was possible to refer to a particular person. 20Since the conversion to TEI XML and the semantic enrichment of the corpus supposed both automatic transformation (via XSLT) and manual annotations, in a preliminary form for all of the documents, we generated a list of all generic labels for the country/institution representatives (<profileDesc> section of the <teiHeader>) (example 1). 21Then the list was manually customized according to the particularity of each document and the specific “actors” involved in the production of the text. Example 2 illustrates a case where only three representatives were retained and further details were provided on their identity. For other situations, the generic label was enough (when the identity was not required or not available). 22In order to be able to analyze the discourse of different participants within the WEU’s policy on armament issues, we have applied a “kaleidoscopic” approach to the corpus. More precisely, discrete fragments were identified and manually annotated inside each document, with reference to the speaker and his or her role as an institution or country representative manifested in the text (example 2). Example 2. Customized list of participants. WEU-Diplo: CR/58/8. 23Given its flexibility of use (either inside a paragraph or encompassing several paragraphs), the <said> tag was chosen for delimiting the different pieces of discourse corresponding to a particular agent (example 3). The choice also facilitated assembling these pieces of information for analysis in the decoding phase (section 4). Example 3. Excerpt from a discourse (oral). WEU-Diplo: CR/58/8. 24The @corresp and @who attributes were used in order to link the marked-up fragment with its producer defined in the <particDesc> unit. Additional attributes (@ana and @direct) were needed to differentiate situations referring either to transcribed oral (direct or indirect speech) or to what we considered written discourse, such as the text of notes (example 4) or studies usually resulting from internal meetings or discussions among institutional bodies (sometimes including “narrative” prose15 or arguments not necessarily coming from an oral account), and then circulated for further discussion/approval within the WEU. Example 4. Excerpt from a discourse (written). WEU-Diplo: Note16 . 17 Distinguished via the values of the @ana attribute, as related to written versus oral discourse. Example 5. Excerpt from a discourse within a discourse. WEU-Diplo: Note18. 26The project also included the identification and annotation in the text of named entities intended for later use (such as indexing and linking to an authorities list) or as a prerequisite of the corpus analysis phase. This identification and annotation allows multiword expressions to be counted as single units of a given type (e.g., organization) in the analysis, rather than as separate words (for instance, Union de l’Europe Occidentale instead of Union, de, l’, Europe, Occidentale). 27The NER task involved a semi-automatic approach using GATE (French NE, Gazetteer, and Gazetteer List Collector plugins)19 for the detection of seven classes of entities: persons, places, organizations, events, dates, products, and functions (official positions). Manual corrections were applied, when necessary, in a post-processing phase. Since the GATE XML output format was different from TEI, an XSLT dedicated stylesheet was created for the transformation of the GATE tags (such as <Person>, <Location>, <Organization>, and <Date>) into corresponding TEI tags (<name> with the attribute @type, and <date>, respectively). A few examples of <name type="person">, <name type="org"> are presented in the previous examples. Further transformation was necessary during the importing of the annotated corpus into the software for textual analysis (see section 4.1). 28The so called “decoding” phase, for corpus analysis and interpretation, consisted of importing and processing the TEI XML annotated documents within a specialized platform, TXM (Heiden 2010),20 that allows the analysis of a large body of texts by means of lexicometrical and statistical methods. The previous encoding served as a basis for discerning or grouping together different types of semantic or structural elements needed for analysis. 29Since TXM supports XSLT transformation at the moment of import (XML/w+CSV option), an XSLT stylesheet was created to accommodate particular formats or conversions required by the software. Therefore, it was not necessary to store different versions of the corpus, one for TXM analysis, the other for Web publication. 21 All the examples of analysis presented in the paper will consequently be displayed in lowercase. 30First, a lowercase conversion21 was provided for consistency reasons relating to the varying ways of capitalizing (e.g., Comité militaire de standardisation, Comité militaire de Standardisation, Comité Militaire de Standardisation). Second, for the named entities to be interpreted as a whole instead of as separate units, a supplementary conversion was needed, all the <name> tags being converted to <w> tags each denoting a “word” of a given type (e.g., person or organization). The special case of hyphenated words where the hyphen appears at a line break (see example 3) had to be considered in an earlier transformation, before import, so that the whole word and not its parts could be counted in the analysis (in the example, constituant instead of cons and tituant as the software would treat it without a <w> tag). 31Part-of-speech tagging via the TreeTagger module integrated into TXM was also applied to the corpus at import in order to allow lemma and part-of-speech statistics and queries. 33Given the identification and annotation of different semantic and structural elements in the encoding phase, TXM allows the creation of partitions (Textométrie 2014, section Construire une partition) by selecting a Structure unit and a corresponding Property (i.e., an XML element and one of its attributes) from the list of structural units and properties recognized by the software for the imported corpus. 34For instance, as fragments of discourse spread throughout the documents were assigned to particular countries or institution representatives (section 3.2), a partition was created based on the <said> element and its @corresp attribute. Figure 1 shows the dimensions of the representatives’ discourse partition, in number of words (occurrences). One can observe that for the selection of documents, there is a “dominance” of the French (14,338 occurrences) and WEU Council (11,276 occurrences) representatives’ discourse, the categories with the lowest size being those corresponding to the French-English delegation (185) and WEU Assembly (72). 35Other types of partitions were also created and analyzed: by speaker, based on the <said> element and its @who attribute, with dimensions varying from 41 (Brindeau) to 6,141 occurrences (Parodi); by type of discourse, using <said> and @ana, and counting 22,780 occurrences of oral discourse versus 32,355 occurrences of written dicourse; and by subtype of institutional documents, taking into account the <text> element and its @subtype attribute, with occurrences numbering between 2,684 for the study category and 38,565 for the minutes. Figure 1. Dimensions of the said_corresp partition. 36The use of the Specificities feature (Textométrie 2014, section Spécificités) allows a comparison of the vocabularies: what is “specific” (either as “overuse” or “deficit”) in a part of a partition, as compared with the parent corpus and a certain threshold.23 The feature is based on a probabilistic model (Lafon 1980) used in TXM to compute a log10 specificity score of a word property (e.g., word form, lemma, or part of speech) for a given part. In the analysis of the WEU-Diplo corpus, it was assumed that the specificity score may draw attention to forms “specific” to the discourse of different country/institutional representatives as compared with the whole. Figure 2 shows an extract from the specificities table computed for the lemma property and the said_corresp partition, sorted by increasing order of the specificity score corresponding to the respres_aca part. Figure 2. Specificities table extract (lemma, said_corresp) sorted by increasing scores for repres_aca. 37Each line in the table corresponds to a value of the chosen property (lemma or a group of lemmas) displayed in the Units column. The second column indicates the frequencies or number of occurrences of the property values in the corpus (with a total T). The other columns contain the number of occurrences of the property values in a part (cumulated by t) and are followed by a corresponding logarithmic score of specificity that can be positive or negative. The table may be sorted in increasing or decreasing order, according to a given column. 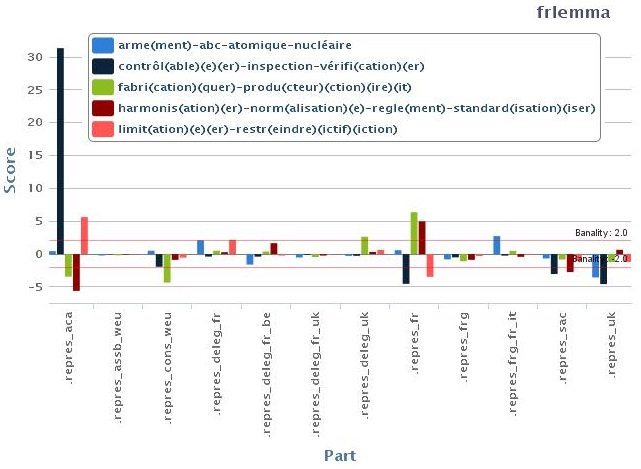 In the case of an increasing score (as presented in the figure for repres_aca), the first property values displayed (e.g., matériel, industrie(l))24 indicate a deficit in use as compared to the whole corpus and the last ones displayed indicate an overuse, while the values with scores around 0 (inside a certain interval) are considered “trivial” (i.e., the specificity measure may not be pertinent for them). 39From a lexical table, a specificities table can be generated, as well as the corresponding diagram for a number of selected units, as shown in figure 3. 40According to the diagram, the ACA representative’s vocabulary is characterized by a high positive specificity score for the groups control-inspection-verification and limitation-restriction, and by negative specificity scores for the groups fabrication-production, harmonization-normalization. Figure 3. Specificities diagram (lemma, said_corresp partition). Selection: armament-control- production-standardization-limitation. 27 See note 41 for the document reference. 41The result is not very surprising given the role of the ACA: it was created to control the stocks of armament of its member states on the European continent (and less related to production/standardization). The negative specificity for arme(ment)-abc-atomique-nucléaire26 in the repres_uk’s discourse is not surprising either, considering that the United Kingdom, although interested in the topic, was not primarily concerned with this issue. Likewise, expected results are revealed for the positive specificity scores for fabrication-production and harmonization-normalization and the negative specificity scores for control-inspection-verification in the repres_fr’s discourse. The former are most probably linked to the selection of documents and, in particular, to the French memorandum presenting the armament agency which focuses on fabrication-production and harmonization-normalization (PWG/A/2).27 Experiments excluding this document28 from the corpus analysis have confirmed the hypothesis (with scores for fabrication and harmonization groups being lowered to the positive banality area). However, the negative specificity score for the control group in repres_fr’s discourse persisted29 after the exclusion of the document from the analysis and may be associated either with the assertion of France’s resistance to submitting its stocks to the ACA’s controls or with an underrepresentation of the control topic in the selection of documents. 42A more general, comparative analysis can be provided for the positive and negative specific forms appearing in the representatives’ discourse, as inspired by the synthesis tables proposed by Bergounioux et al. (1981) and Bonnafous (1981). Table 1 synthesizes the results for seven participants, a selection of shared lemmas or groups considered of interest for the study, and a set of specificities scores (in brackets) above and under the positive and negative banality thresholds. Table 1. Comparative view of specificities scores. Selection: said_corresp partition. 33 En. cooperation on missiles matters, European cooperation in the aeronautic field. 43The high positive specificity score for coopération/coopérer30 in the repres_cons_weu’s discourse can be explained by the role of arbiter and conciliator of the WEU Council, which was intended to promote cooperation among its members in all the domains. A closer look at the contexts where this group appears shows recurrent, general patterns like coopération en matière d’armements, coopération des pays européens en matière d’armements, and cooperation européenne en matière d’armements31 occurring both in the repres_cons_weu and repres_deleg_fr’s discourse (which also displays a positive score but with a lower value) or more specific occurrences, such as coopération intergouvernementale en matière de recherche, coopération intergouvernementale en matière d’études32 (repres_cons_weu), coopération en matière de missiles, or coopération européenne dans le domaine aéronautique33 (repres_deleg_fr). 35 Groupe européen indépendant de programme. En. Independent European Programme Group (IEPG). 44The highest positive score in the table (finabel for repres_sac) may be explained by the frequent mentions of the organization during the meetings of the SAC (acting as a link between it and the United Kingdom, not a member of Finabel),34 as well as by the adherence of Great Britain to this organization referred to in the repres_sac’s discourse (see also section 4.2.2.4). The second highest positive and negative scores (g.e.i.p. :35 for repres_cons_weu and repres_fr, respectively) are less clear but one can observe that the term tends to co-occur with the name of another organization (c.d.n.a. )36 in the repres_cons_weu’s discourse, while being completely absent (0 occurrences) from the French representatives’ discourse. The main reason seems to be the substance of the discussions linked to the competences of different organizations about standardization. Further examination is also needed to interpret the deficit of the group control-inspection-verification reflected by negative specificity scores for repres_uk and repres_fr (0 and 7 occurrences, respectively, out of a total of 85) that can be determined, as already mentioned, by the selection of documents, potentially more centered on the production and standardization of armaments than on their control. 45Another type of analysis resulting from the encoding was an exploration of the combination of lemma and part-of-speech (POS) tagging and specificity measures, which may be related to the so-called “lexical profile” (Guyard 1981) of a participant in the institutional discourse. It consists of a list of relevant lemmas (with positive specificities above the banality threshold) and corresponding to certain parts of speech. Table 2 illustrates this type of profile for two representatives (France, United Kingdom) as individuals and three categories of POS (noun, adjective, and verb), obtained by taking into account specificity scores for the said_who partition. Table 2. Lexical profiles. Selection (lemmas, said_who partition). 37 En. common, joint, mutual versus bilateral, multilateral. 38 En. joint regional programme, common interest, common defence, common studies, mutual funds. 39 En. bilateral basis, bilateral discussion, bilateral arrangements, bilateral steering committees. 46For the adjectives, we can point out an opposition on the axis commun versus bilatéral, multilatéral37 manifested in contexts such as programme (régional), intérêt, défense, études, fonds commun(e)(s)38 (Chauvel) versus base, discussion, arrangements, comités directeurs bilatéra(l)(le)(ux)39 (Lloyd). The first profile is probably less clearly defined, but for the second one, the association of the lemmas provided for all three categories seems to convey a certain sense of action towards cooperation and dialogue. 47Similar specificities-based analyses (not described here in detail) were performed for other categories of word properties: POS, for instance, which indicates a high positive specificity score (17.95) for the conditional verbal form in the repres_fr discourse (said_corresp partition); or other partitions, such as said_ana or text_subtype, that take into account the type of annotated discourse (oral/written) or the subtype of the document (minutes, note, study, or memorandum). 48The analysis of specificities was combined with other methods, both of a quantitative and qualitative nature, for examining the documents, for instance, by querying for specific word properties (lemmas, word forms, POS, or combinations of these elements) and by means of the concordances and co-occurrences features (Textométrie 2014, sections Construire une concordance, Cooccurrences, Lexique et Index). Figure 4 presents the results of a query for “finabel” and the corresponding list of concordances that displays a left and right context, the file, and the representative’s discourse containing the word (i.e., repres_sac with the highest positive specificity score for this unit, as shown in table 1). Figure 4. Concordances. Extract (“finabel,” said_corresp partition). 49A double click on a line in the concordances list provides a highlighted document view, as illustrated in figure 5. Figure 5. Document view with highlighted items. Extract. WEU-Diplo: SAC/72/R-10840 . 50Co-occurrences may also be displayed and sorted according to the frequency, co-frequency, specificity score, or the mean distance between the keyword and the co-occurrent, as in the example presented in figure 6. Some of the co-occurents can be observed in the document view as well, figure 5 above. Figure 6. Co-occurents of finabel sorted by mean distance. Extract (said_corresp partition). 51As illustrated in the previous section and in figures 4, 5, and 6, Great Britain and Finabel often co-occur in the discourse. This is probably (1) because of the particular attention of the SAC to informing the British representatives about the activities of the organization and (2) because the adherence of the United Kingdom to Finabel and its consequences is often brought into discussion. 52In order to avoid misinterpreting the specificities or to confirm some of the hypotheses suggested by this method, we often needed to combine it with co-occurrences, concordances, and visualization of the document. Therefore, co-occurrences can provide a quantitative perspective on the co-presence of some words, lemmas, or entities in the context of a given target, which in combination with concordances and document visualization may support qualitative analysis and interpretation. 53The TEI XML encoding and TXM analysis related to the research questions on arms design, production, and control within the WEU have enabled a set of more or less predictable results, the latter needing further examination. Among the former, we can mention those referring to the SAC and ACA roles. Arms production and control was a major part of WEU’s work, despite its somewhat mixed record in this area. Protocol IV of the Modified Brussels Treaty established the ACA, while after advocating the establishment of an armaments agency in its memorandum of January 3, 1955,41 France proposed the setting up of the SAC during a meeting of the working party on production and standardization of armaments, on the basis of Article VIII(2) of the Modified Brussels Treaty. The SAC was subsequently created on May 7, 1955. Although the United Kingdom never opposed the SAC’s activities, it actively attempted to restrict its role, both because of its resistance to any notion of supranationality42 and because it was convinced that NATO and the organizations related to it were more effective and better positioned to achieve standardization in the field of armaments.43 The interpretation of the less predictable results is not straightforward, since they may have been determined by an under- or overrepresentation of certain elements in the discourse, based on the selection of documents. The same could be said about the negative specificity score for the control group in repres_fr’s, but this finding is also likely to be associated with the assertion of France’s resistance to submitting its nuclear stocks to the ACA’s controls and the need to avoid making statements on the subject. Since the size of the corpus was relatively small, and not all the information for the documents on the selected topic and their types in the WEU archive was available, extrapolations about the TXM probabilistic model and the observed linguistic patterns at a larger scale than the pilot sample should be avoided at this stage. 54The TEI XML combined with the TXM analysis tools can also reveal inconsistencies which may draw attention to the need for further encoding and testing additional documents. On the other hand, it is also important to take into consideration how far (or how well) the researcher/user knows the content of the documents, as a lack of context can sometimes lead to misinterpretation. 55The goal of the pilot project has been to address research questions mainly related to the French and British positions on the topic of arms design, production, and control within the WEU from 1954 to 1982. In particular, we were interested in combining traditional, historical inquiry with TEI XML encoding and decoding in a corpus analysis phase for the identification and interpretation of linguistic patterns in the discourse of different countries and institutional representatives on armaments issues. 56Given the small scale of the corpus used in the project and the fact that it may not be a sufficiently representative sample means that a generalization of the results should not be performed without extended testing on an additional set of documents, conducting further evaluation of the probabilistic model and an estimation of the sample as compared to the collection from which it was extracted. From a methodological perspective, however, the TEI XML encoding and decoding experiments have proved that the approach can assist qualitative and quantitative methods for the study of historical and discursive phenomena in a collection of institutional documents and a chosen theme. More precisely, the encoding may be quite helpful for researchers, even if they have no previous knowledge of the content of the documents. That is to say, if meaningful thresholds for analysis are set, one can find out the main topic of the documents, and the tags may help in discovering who the speakers are and the main “orientation” of their speech (i.e., their position) in terms of what is specific to their discourse. However, in order to enhance the reading of the specificities, combination with other methods, such as concordances, co-occurrences, and document visualization, is required. 57Going back to the initial idea of considering a new link in the decoding–encoding chain suggested by Burnard, we see the TEI encoding as adding a “material” layer to the original text, which further supports both machine and human interpretation (decoding). In a larger sense, despite the inherent bias and limitations related to the selection and the number of documents used in the study, we have attempted to prove the “materiality” of the TEI encoding and decoding as a basis for hermeneutic inquiry in the quest for producing knowledge via digital “instruments,” as Capurro and Idhe have previously stated in their accounts on a digital and material hermeneutics. Andrews, Tara. 2013. “The Third Way: Philology and Critical Edition in the Digital Age.” Variants: The Journal of the European Society for Textual Scholarship 10: 61–76. Bergounioux, Alain, Michel Launay, Josette Lefvre, René Mouriaux, and Jean-Pierre Sueur. 1981. “Le vocabulaire des confédérations syndicales ouvrières: une analyse des spécificités.” Mots 2: 139–56. doi:10.3406/mots.1981.1025. Bonnafous, Simone. 1981. “Le vocabulaire spécifique des motions Mitterrand, Rocard et CERES au congrès de Metz (1979).” Mots 3: 79–94. doi:10.3406/mots.1981.1040. Burnard, Lou. 1998. “On the hermeneutic implications of text encoding.” Accessed March 6, 2016. http://users.ox.ac.uk/~lou/wip/herman.htm. Capurro, Rafael. 2010. “Digital Hermeneutics: An Outline.” In AI & Society 25(1): 35–42. Accessed March 6, 2016. http://www.capurro.de/digitalhermeneutics.html. doi:10.1007/s00146-009-0255-9. Delhauteur, Dominique. 1991. “Les activités du Conseil de l’UEO en matière de coopération dans le domaine des armements.” In dossier “notes et documents” no. 160. Brussels: GRIP (Groupe de recherche et d’information sur la paix et la securite). http://www.grip.org/fr/node/1014. Guyard, Marie-Renée. 1981. “Spécificités d’auteurs dans Le Surréalisme au service de la Révolution.” Mots 2: 95–122. doi:10.3406/mots.1981.1023. Hayles, Katherine. 2005. My Mother Was a Computer: Digital Subjects and Literary Texts. Chicago: University of Chicago Press. Excerpt: http://www.press.uchicago.edu/Misc/Chicago/321487.html. Heiden, Serge. 2010. “The TXM Platform: Building Open-Source Textual Analysis Software Compatible with the TEI Encoding Scheme.” In Proceedings of the 24th Pacific Asia Conference on Language, Information and Computation, edited by Ryo Otoguro, Kiyoshi Ishikawa, Hiroshi Umemoto, Kei Yoshimoto, and Yasunari Harada, 389–398. Tokyo: Institute for Digital Enhancement of Cognitive Development, Waseda University. Accessed July 24, 2017. http://halshs.archives-ouvertes.fr/halshs-00549764/en. Ihde, Don. 2003. “More Material Hermeneutics.” Paper presented at the meeting on “Hermeneutics and Science,” Tihany, Hungary, June 7 - 11, 2003. Accessed March 6, 2016. http://humanitieslab.stanford.edu/23/admin/download.html?attachid=178178. Lafon, Pierre. 1980. “Sur la variabilité de la fréquence des formes dans un corpus.” Mots 1: 127–65. doi:10.3406/mots.1980.1008. Manoff, Marlene. 2006. “The Materiality of Digital Collections: Theoretical and Historical Perspectives.” portal: Libraries and the Academy 6(3): 311–25. doi:10.1353/pla.2006.0042. McGann, Jerome. 2001. Radiant Textuality. New York: Palgrave. Nikander, Pirjo. 2008. “Constructionism and Discourse Analysis.” In Handbook of Constructionist Research, edited by James A. Holstein and Jaber F. Gubrium, 413–28. New York: The Guilford Press. Accessed March 6, 2016. http://www.helsinki.fi/sosiaalipsykologia/arkisto/Nikander%20ch21%202008.pdf. Phillips, Nelson, Thomas B. Lawrence, and Cynthia Hardy. 2004. “Discourse and Institutions.” Academy of Management Review 29(4): 635–52. doi:10.5465/AMR.2004.14497617. Pierazzo, Elena. 2014. Digital Scholarly Editing: Theories, Models and Methods. Surrey, England: Ashgate; HAL open archive, <hal-01182162>. Accessed March 6, 2016. http://hal.univ-grenoble-alpes.fr/hal-01182162/document. Rémacle, Eric. 2009. “L’Union (de l’Europe) occidentale durant la guerre froide (1948–1989).” In L’Amérique, l’Europe, l’Afrique (1945–1973) [America, Europe, Africa (1945–1973], edited by Eric Rémacle and Pascaline Winand, 187–234. Brussels: PIE-Peter-Lang. Textométrie. 2014. Manuel de TXM, Version 0.7. Accessed March 6, 2016. http://textometrie.ens-lyon.fr/spip.php?rubrique64. Thornborrow, Joanna Sarah. 2002 Power Talk: Language and Interaction in Institutional Discourse. Harlow: Longman. Van Dijk, Teun A. 1993. “Principles of critical discourse analysis.” Discourse & Society 4(2): 249–83. Accessed March 6, 2016. http://www.discourses.org/OldArticles/Principles%20of%20critical%20discourse%20analysis.pdf. 1 The exploitation of the WEU archives follows the decision C(11)05-Final of May 10, 2011, by the Permanent Council of the Western European Union, which appointed ANLux—the Archives nationales de Luxembourg—as the official depository of the WEU archives and gave the CVCE (http://cvce.eu/), a research and documentary center in European Integration Studies, the task of scientifically exploiting these holdings, including their publication in any form. 2 The WEU was created on the October 23, 1954, with the signing of the “Modified Brussels Treaty” by France, Belgium, Luxembourg, the Netherlands, the United Kingdom—all five previously members of the Western Union created in 1948—and the Federal Republic of Germany invited to join the new organization. It became the first European Defence Organisation and its missions covered the settling of the problem of the Saar, the monitoring of German rearmament, and the promotion of the defense of Western Europe. The Treaty of Brussels contained a mutual defense clause in Article V. For more information, please consult http://www.cvce.eu/en/recherche/unit-content/-/unit/72d9869d-ff72-493e-a0e3-bedb3e671faa/1c06c877-402b-45d1-a126-792e99cf3fc3. 3 Eric Rémacle referred to the “instrumentalisation” of WEU by these two countries, which he identified as “successive leader states” within the organization. See Rémacle 2009, 197. 4 Related to the specific research question, that is, the study of linguistic patterns in the discourse of different country/institutional representatives as described in section 4. 6 For example, CR(58)8 = CR (for compte-rendu, or minutes, of a Council meeting), the year in brackets, then the document number; PWG/CR/4 = PWG (we think that PWG stands for Production Working Group), CR (for compte-rendu) and the number of the meeting (the fourth meeting); C(80)40—we have noticed that the letter C was generally used for the final version of the reply to a recommendation or written question, followed by the date in brackets, although the meaning of the second number is not clear. The letters WPM followed by a number in brackets were used for the various versions of replies to recommendations and/or written questions, but we think that the date was not indicated in brackets during the early years of WEU’s activity, until the end of the 1960s or the early 1970s; if a draft was amended by a working group, the version number was added after a solidus, e.g., WPM(77)25/1. 9 The terms “delegate” and “representative” were used to distinguish the collective discourse of a country (for instance, in the answer to a recommendation) from the discourse of an individual (in a Council’s meeting for instance), although the individual was also speaking for a country. 10 Other meetings were often mentioned, such as a previous or forthcoming ministerial meeting or a meeting of the North Atlantic Council. 11 TEI Consortium. 2015. TEI Guidelines Version 2.8.0. Last updated on April 6. http://www.tei-c.org/Vault/P5/2.8.0/doc/tei-p5-doc/en/html/. 12 En. “PRESENT: Prof. Dr. L. ERHARD: Federal Republic of Germany; M. A. de STAERCKE: Belgium.…” Union de l’Europe occidentale. Commission intérimaire. Groupe de travail sur la production et la standardisation des armements. Troisième séance plénière tenue au Palais de Chaillot le 21 janvier 1955 à 15 heures 30. Paris: 22.01.1955. PWG/CR/2. Pp. 1–3; Annexe A; Annexe B. Archives nationales de Luxembourg (ANLux). http://anlux.lu/. Western European Union Archives. Armament Bodies. CPA/SAC. Comité permanent des armements. File CPA-033. Volume 1/1. 13 En. “Mr. Selwyn LLOYD considered that … .” Conseil de l’Union de l’Europe occidentale. Extract from minutes of the 108th meeting Ministers of WEU Council held on 5 March 1958. Rome. II. Echanges de vues sur la coopération en matière de recherche, développement et production d’armements. CR (58)8. Pp. 5–9. Archives nationales de Luxembourg (ANLux). http://www.anlux.lu. Western European Union Archives. Secretariat General/Council’s Archives. 1954–1987. Subject dealt with by various WEU ORGANS. Year: 1958, 01/06/1957–30/04/1958. File 442.00. Volume 1/4. 14 Agence pour le contrôle des armements. Note. 04.1966. 6 p. Archives nationales de Luxembourg (ANLux). http://anlux.lu/. Western European Union Archives. Armament Bodies. ACA. Agency for the Control of Armaments. Year: 1957, 01/01/1957–31/12/1963. File ACA-035. Volume 1/1. 16 See note 14 for the document reference. The ellipsis indicates missing paragraphs, omitted here for concision. 18 Agence pour le contrôle des armements. Division III. Note à l’intention du Directeur de l’ACA. Contrôle sur place des armes atomiques se trouvant dans des dépôts britanniques sur le continent européen. 22 juin 1962. Archives nationales de Luxembourg (ANLux). http://anlux.lu/. Western European Union Archives. Armament Bodies. ACA. Agency for the Control of Armaments. Year: 1957, 01/01/1957–31/12/1978. File ACA-218. Volume 1/1. The ellipsis indicates missing paragraphs or fragments, omitted here for concision. As far as the intervention of Mr. Heath is concerned, it is not specified anywhere that he was actually speaking English, but since it was a working language, it seems logical that he was expressing himself in his native language. Thus, this could be a translation, most probably from an internal translation service. 22 A subcorpus based on the @lang="fr" property (an attribute of the <text> element) was created in TXM for the analysis of the documents’ content, excluding the data from the <teiHeader>. The whole corpus (<teiHeader> included) comprised 7,015 items and 105,897 occurrences. 23 In TXM, it is called the banality threshold, fixed by default at the value of +/- 2.0 for positive and negative specificities scores, respectively. In figure 3, the banality thresholds are rendered by (red) horizontal lines. 28 The size of the repres_fr part in said_corresp partition decreased from 14,338 to 10,269 words after excluding PWG/A/2. 29 In fact, it increased slightly, from -4.5257 (7 out of a total of 85 occurrences in the whole corpus) to -4.7338 (3 out of 81 occurrences). 31 En. cooperation on armament matters, cooperation on armament matters among European countries, European cooperation on armament matters. 32 En. intergovernmental cooperation on research matters, intergovernmental cooperation on study matters. 34 Finabel is a Land forces organization created in 1953 with five initial members: France, Italy, Belgium, Luxembourg, and the Netherlands. Germany became a member in 1956. 36 Conférence des directeurs nationaux des armements. En. Conference of National Armaments Directors (CNAD). 40 Compte rendu de la 108ème Réunion du Comité Permanent des Armements, tenue à Paris, le 29 septembre 1972. Union de l’Europe occidentale. Comité permanent des armements. Compte-rendu de la 108ème réunion du Comité permanent des armements tenue à Paris le 29 septembre 1972. Paris: 18.10.1972. SAC (72)R/108. pp. [s.p]; 3–4; annexe; pp.1–5. Archives nationales de Luxembourg (ANLux). http://www.anlux.lu. Western European Union Archives. Secretariat-General/Council’s Archives. 1954–1987. Organs of the Western European Union. Year: 1967, 16/03/1956–30/04/1967. File 250.10. Volume 2/2. 41 Western European Union. Interim Commission. Working Party on Production and Standardisation of Armaments. Secretary General’s note. Paris: 17.01.1955. PWG/A/2.18 p. Archives nationales de Luxembourg (ANLux). http://anlux.lu/. Western European Union Archives. Armament Bodies. CPA/SAC. Comité permanent des armements. File CPA-032. Volume 1/1; Delhauteur 1991, p. 6. 42 Western European Union. Interim Commission. Working Party on Production and Standardisation of Armaments. Statements made by the delegations at the first and second sessions of the Working Group. Paris: 21.01.1955. PWG/A/6. Annex A and Annex F. Archives nationales de Luxembourg (ANLux). http://anlux.lu/. Western European Union Archives. Armament Bodies. CPA/SAC. Comité permanent des armements. File CPA-032. Volume 1/1. 43 The National Archives of the UK (TNA). Foreign Office, Western Organisations and Co-ordination Department and Foreign and Commonwealth Office, Western Organisations Department: Registered Files (W and WD Series). Western European Union (WEU). Future of Standing Armaments Committee of Western European Union. 01/01/1975–31/12/1975, FCO 41/1749 (Former Reference Dep: WDU 11/1 PART B). Florentina Armaselu is involved in text and technologies research at the University of Luxembourg. She obtained a PhD in comparative literature (2010) and a MSc in computational linguistics (2003) at the University of Montreal, Canada. Her current research focuses on digital editions, text encoding and text analysis. Verónica Martins specialized in European Studies and her current research focuses on the Mediterranean region and security questions, mainly counter-terrorism. She attended the College of Europe where she got a MA in European Studies. In 2012, she obtained her PhD in Political Science, Europe specialisation, in a joint international supervision in Sciences-Po Paris and University of Minho. She worked as a researcher at the Centre Virtuel de la Connaissance sur l’Europe on a project on Franco-British relations within the Western European Union. Dr Catherine (Kate) Jones is interested in the development of useful and usable systems and data analysis to form meaningful narratives. She is based at the University of Luxembourg. She studied for an MSc in Geographical Information Systems at University College London in 2002 and went on to complete a Knowledge Transfer Partnership, PhD and Post Doc at the same university, with a focus on interdisciplinary research and mapping technologies.